Do you want to learn about NLP? Do you want to know how NLP can benefit you in your Personal & Professional Life? 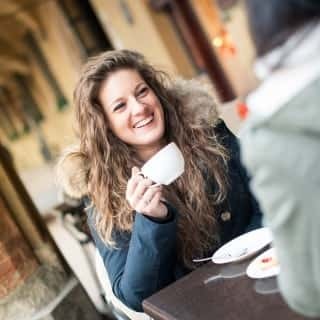 Would you like a taster before committing to one of our NLP Practitioner Certification Courses? 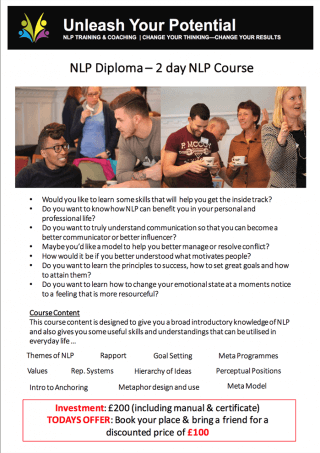 The NLP Diploma course is designed as an introduction to NLP for people who are curious about how NLP can assist them in their every day lives. The 2 day course is a great introduction to NLP for people who would like to learn some of the NLP skills and are currently not in a place where they want to to commit to the 7 day NLP Practitioner course. The NLP Diploma Course is presented by our Lead Trainer, Laura Evans (Certified ABNLP Trainer of NLP) and is a great way for you to get a fun and interactive taste of what NLP can offer you. NLP is both an art and a science; the NLP Diploma will give you a good grounding in some of the skills set and ways of thinking that people in the NLP community have enjoyed for years. We are proud to be the only NLP training provider based in Wales able to offer you the chance to go all the way through from certified NLP practitioner, to certified Master Practitioner and onto NLP Trainers Training and this means that you won’t need to change provider the further up the NLP career ladder you go. We are also privileged to be recognised by the American Board of NLP (ABNLP) as an Institute of Neuro-Linguistic Programming (NLP). Please note, this NLP Diploma course is not a two day sales pitch (like many other Introduction to NLP courses currently on the market). On our NLP Diploma course you will learn and walk away with some new skills, knowledge and understanding that will help you in your every day life AND you will come to grips with the basics of NLP. If you want to learn the whole suite of NLP Practitioner skills you can book onto our certified NLP Practitioner Course (you do not have to complete the NLP Diploma before you can book onto the NLP Practitioner Course – you can book directly onto it with no prior NLP experience). At the end of the two days you will be presented with the certificate “NLP Diploma” and all our courses are approved by the ABNLP – the world’s largest NLP certification board. You can use your Unleash Your Potential Ltd NLP Diploma certificate to join the ABNLP as an ‘NLP Associate’. 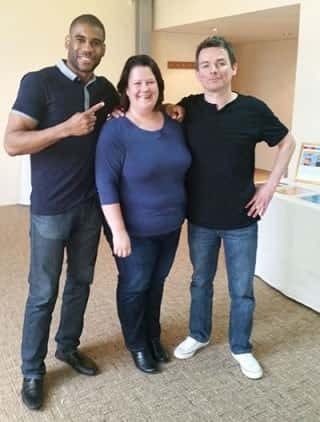 If you enjoy the two days and want to go on to further trainings, like the NLP Practitioner course, we will credit the price that you paid for the NLP Diploma against the NLP Practitioner Course. The course content is designed to give you a broad knowledge of NLP and also to give you some useful skills and understandings that can be utilised in your everyday life. Presuppositions of NLP – a great set of statements, which if we accept as true, makes our world a lot easier! Controlling your emotional state (Anchoring)– learn how to change your emotional state at a moments notice to a feeling that is resourceful and watch how your results change! Our aim by offering the NLP Diploma is to offer people a highly valuable and quality experience of NLP – we do not want this to be a seminar, we want people to go away with skills they can put into practice straight away. To ensure that this is possible, we will be limiting attendance at these events. Places are £200 per person including course manual and certification. We anticipate high demand for these high quality, high value and affordable introductory NLP courses and therefore we encourage you to book now! You can check out our Course Schedule to see when we are next running an NLP Diploma course.